On Saturday the 25th, he participated in Family Day and spent a few hours painting a mural with some of his younger fans. On Sunday, the 26th he signed autographs with former Giants great Sean Landetta. On Monday the 27th it was a stint with NY Jets star Quinton Coples and New Orleans Saints player Kevin Reddick. 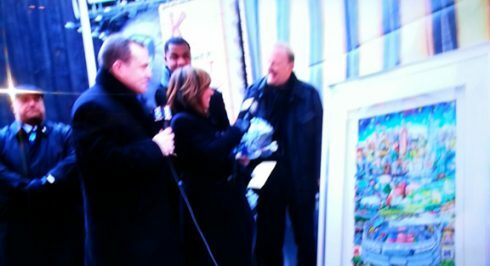 Tuesday the 28th featured an appearance on Fox 5’s Good Day NY with Quinton Coples to promote the original work currently being auctioned to benefit the Breast Cancer Research Foundation, and a tour of the NY area airports for Super Bowl posters signings for American Airlines. And on Thursday, it was NY Giant Pro-Bowler Antrel Rolle appearing with Fazzino at the NFL Shop. The festivities continue over the weekend with all of the happenings at Super Bowl Boulevard. 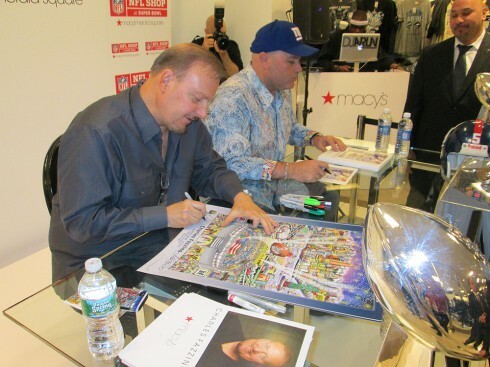 On Friday evening, Fazzino will appear at the NY Giants House just off the Boulevard and then he’ll be at Macy’s for much of Saturday. Stop by and see us! !